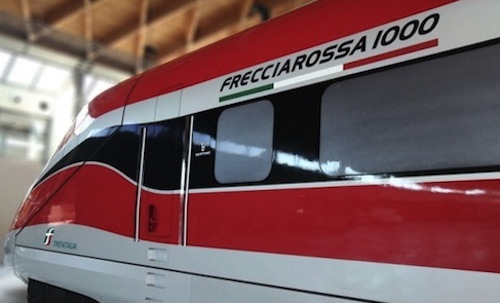 The Italian national company Trenitalia confirmed its Frecciarossa 1000 will begin running on June 14th of this year with it will be possible to go from Rome to Milan in just 2 hours and 20 minutes! The Frecciarossa 1000 was built by a consortium of Bombardier and AnsaldoBreda and will run at a maximum speed of 400 km/h making it the fastest train ever-mass produced in Europe. According to FS, six trainsets have now been accepted for revenue service, with all 50 on course to be delivered by early 2017. The announcement was made during a non-stop run between Milano and Roma conveying Italian President Sergio Mattarella. In addition to the speed, Frecciarossa 1000 will offer comfort and functionality, LED lighting, climate control, restoration, suitable access for people with reduced mobility, on-board monitor, wifi and sockets for laptop,tablet and smartphone.